Happy mid-week, chickadees! Let’s dive right into the good stuff. 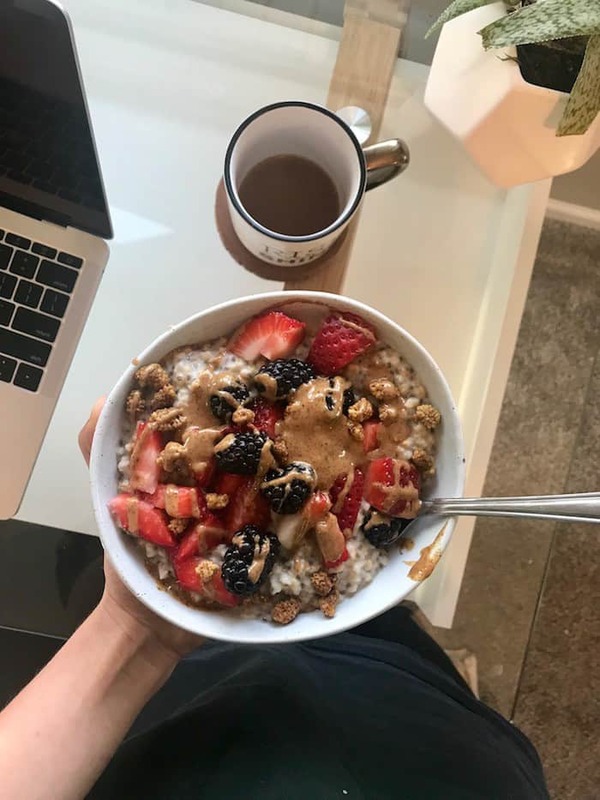 Steel-cut oats + chia seeds with almond butter, berries, banana, cinnamon, and mulberries (just ordered another bag!). 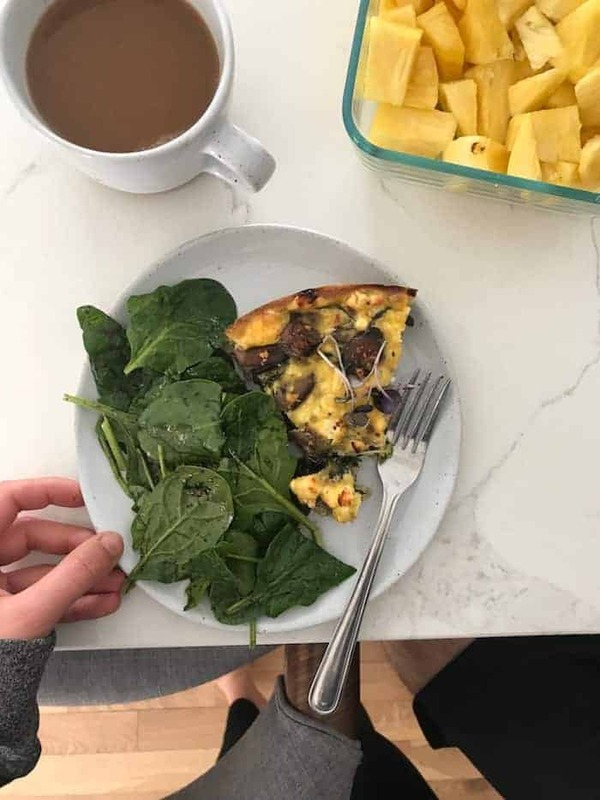 Spinach, mushroom, and artichoke quiche with spelt crust based off this quiche. Full recipe coming soon! Juicy pineapple and always coffee on the side. 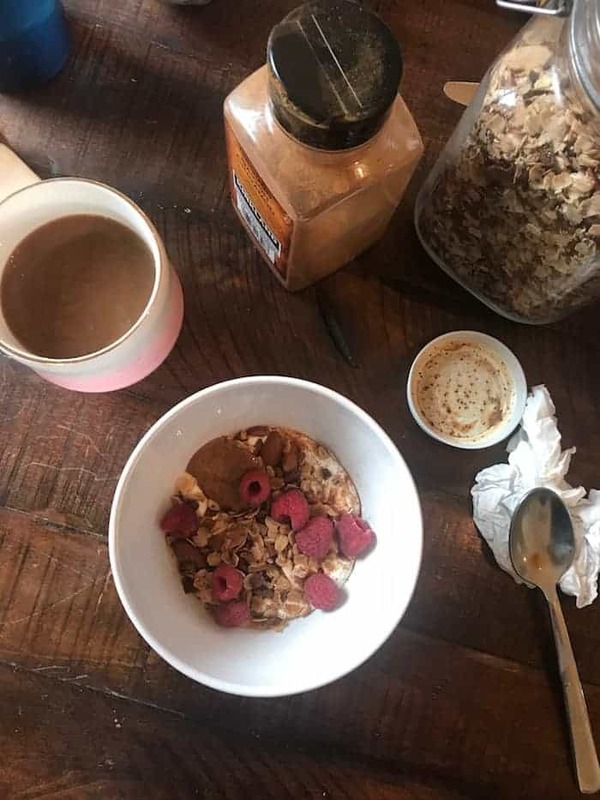 Siggi’s full fat yogurt, homemade granola, raspberries, and banana. Thanks for the best breakfast dates, Simi! 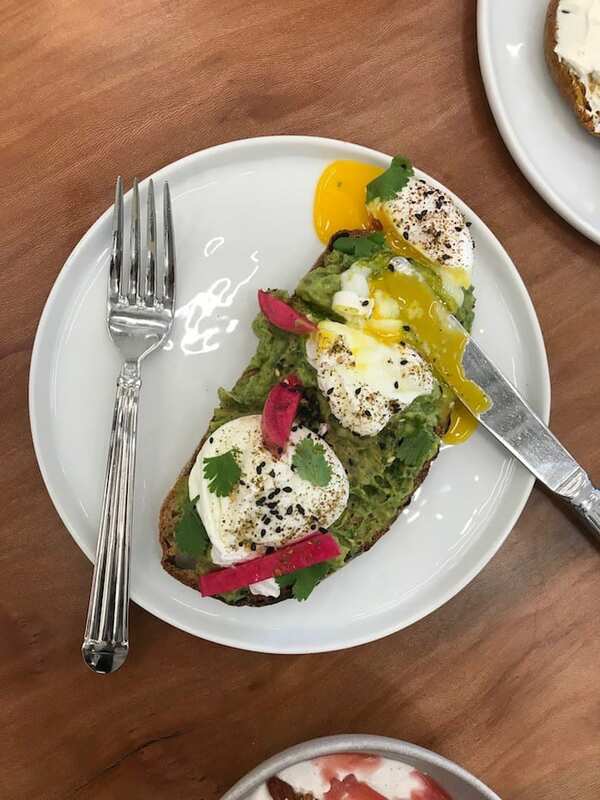 Brunch toast from Alchemy Grandview’s menu (opening so soon!) with avocado mash, cured lemon, sumac, poached eggs, and pickled turnips. 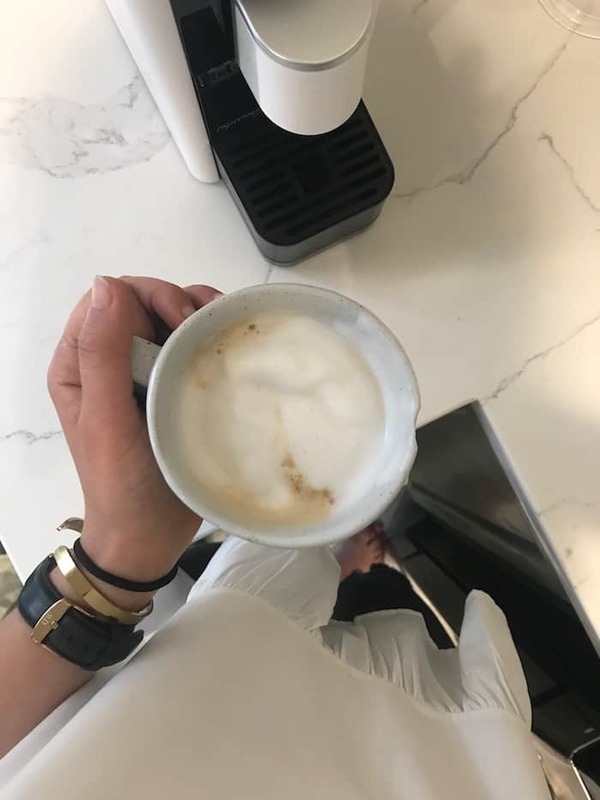 All the cappuccinos with frothy almond mik courtesy of my beloved new espresso machine and frother! 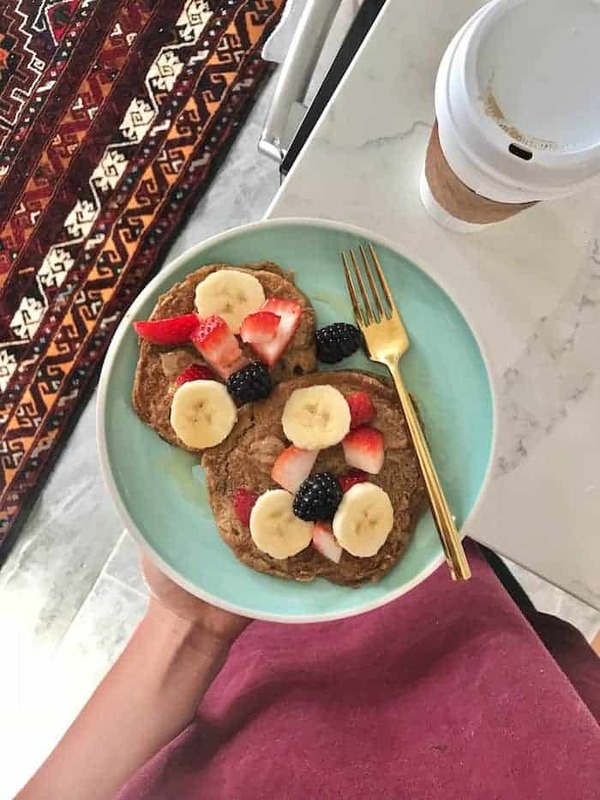 Cinnamon oat pancakes from Love Real Food with berries, almond butter, and maple syrup. Local sourdough toast with avocado, strawberries, tahini, and salt. Israeli power salad with za’atar roasted sweet potatoes (recipe coming soon), red cabbage, plus baba ganoush from Aladdin’s. Brown basmati rice, arugula, goat cheese, moroccan roasted carrots, chickpeas, pistachios, dates, and lemon olive oil dressing. Lentil taco skillet stuffed into blue corn tortillas with salsa, cabbage slaw, avocado, and hot sauce. More leftover tacos served over spinach. Mix of all the leftovers in my fridge + juicy pineapple. Moroccan Lentil Stuffed Eggplant with avocado, a huge salad, and berry crisp for Shabbat! Prawns with saffron curry, cauliflower, peas, and crispy chickpeas from The Sycamore. Quinoa, chickpeas, sweet potatoes, chard, sautéed Brussels sprouts, parsley, thyme, cucumber, walnuts, and tahini lemon dressing. Salmon tacos for Alchemy 2 with harissa labneh, charred pineapple, red cabbage, cilantro, and pickled peppers. The yummiest snack platter with beet hummus, Simple Mills crunchy crackers, and veggies. Strawberries with chocolate tahini spread. The best Banana Bread made with namaste flour because so many people have asked about gluten-free flour for this recipe and it worked great! Hummus with snap pea crisps. Berry Crisp! I doubled my recipe and still used an 8×8 pan and it was awesome. So delish with vanilla ice cream! Almond sea salt Bark Thins. And popcorn! I went on a Costco run for all the office snacks. Mocha chip Perfect Bar—such a yummy new flavor. Make this week a stellar one, friends! Everything looks so good (as per usual) but mmmm the shrimp dish is making me hungry! Yum! I always love these posts. These last few weeks have been crazy so I’ve barely spent time in the kitchen but posts like this always give my in the inspo I need to create some yumminess. Oh man that is tragic! Girl we’re gonna Alchemy hop all over!! first of all, that brunch toast from Alchemy? UGH. drooling hard. and i love that combo you have with the rice/dates/carrots/pistachios/goat cheese. that sounds like actual heaven and i need to try it stat! have a great rest of your week and thank you for sharing these posts!! Yayyy you’re so sweet! Come visit! Omg. That banana bread — yes, please! Hope you’re having a good week, Alexis! Your salads always look AMAZING!! You use some super yummy combos. Thank you for all the veg inspiration! !